I’m often prone to exaggeration, but I’m telling you the honest-to-goodness truth when I say I eat these green beans a minimum of five times a week. The green beans and olive oil are so healthy and adding in the seasonings just makes them wonderful. I love them so much and they’re so easy to make, I bring them with me every day for lunch! In fact, my green bean infatuation has become a long-standing joke with my co-workers. They used to make bets on whether or not I’d brought the green beans but now they don’t bother. They know that no matter what else I’ve brought, the green beans will accompany it. They watch me heating my food with knowing smiles and slowly shake their heads as I take my seat. I smile back and eat them in blissful reverence. They wouldn’t mock if they knew what they were missing. Cook/heat the green beans, drizzle with olive oil and sprinkle the dressing mix over the top. Toss together and serve hot. To make an individual serving, I heat a can of green beans (yes, a serving to me is an entire can! ), drizzle with a little EVOO and then sprinkle as much dressing mix as I want. Posted in Italian, Lighter Fare, My Favorites, Side Dishes, Vegetarian & Vegan and tagged easy, fast, green beans, Italian, recipe. Bookmark the permalink. 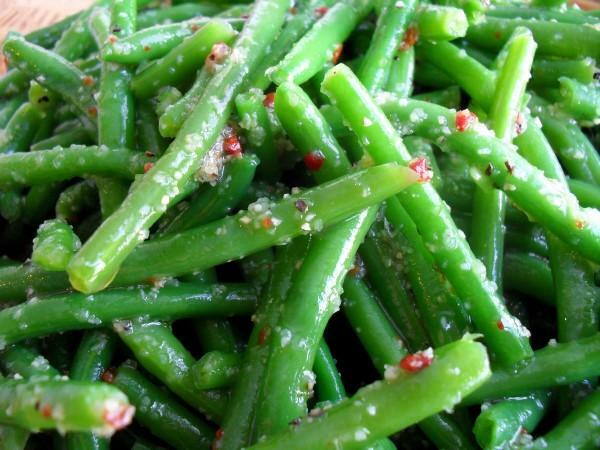 I love green beans too, and this looks so flavorful! I bet it would be fantastic on broccoli as well! I agree with you on the brocolli! You can use the Italian dressing mix with your choice of fat, be it olive oil, butter, or whatever, and put it on almost any veggie with great results. One of my other favorites is mixing it with butter on peas. So good! I too can eat an entire can of green beans. This is a great way to spice them up, thanks for the tip. Will definitely make again and will try on other green vegetabls. Glad to hear it, Denise! Thanks so much for the feedback. YUM, these are so bright.. lookin good! LOVE the idea of putting the italian packet on it! I’m so going to try it, I LOVE green beans! Thanks! One word.. YUMMY! Thanks for the recipe. I would try this out this week. ooo they so look good! How does this do warmed up after being in the fridge all night? Nancy I’ve honestly never had any leftovers to test it but I don’t see why it wouldn’t reheat well.